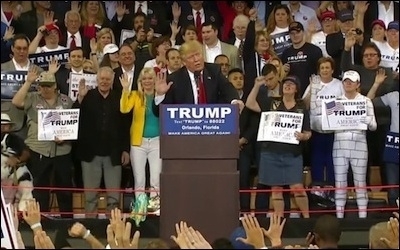 Donald Trump urged his supporters at a March 5 rally in Orlando, Florida, to raise their right hands and promise to support him, echoing Hitler salutes at Nazi rallies of the 1930s and 1940s. The short answer is "no," but there's plenty of room for discomfort. ... When Trump asserts that politicians are "all talk and no action" he casts doubt on a great virtue of elected legislatures in democracies—namely, the creation of a public sphere in which people with divergent views can talk with and to one another. Trump does not, as Hitler and Mussolini did, openly denounce the institutions of liberal democracy. Yet like them he accuses those institutions of failing to adequately address political and economic crises. The classic dictators denounced democracy itself, especially the peaceful democratic competition among political parties, as a formula for national weakness. Trump has not done so, but his dictatorial personality suggests that he can do singlehandedly what American political institutions have failed to do for many years running. He postures as the man on the white horse, as someone who would make Carl Schmitt proud. The fascists and the Nazis combined violent rhetorical attacks and insults with well-organized paramilitary organizations that inflicted violence, leading to injuries and deaths among their political opponents. Trump has mastered the art of the bruising insult but has not made organized violence a part of his campaign. While he thrills his audiences with rhetorical flourishes about wanting to punch opponents in the face, he hasn't organized a paramilitary organization that would inflict physical harm on his opponents. The fascist movements were schizophrenic about the relationship of society to the state. As they sought political power, fascists and Nazis pointed with pride to mass movements that, in their view, gave them a democratic mandate beyond the supposed fakery of the voting process. Trump has begun to refer to his candidacy as a political movement, and some of his supporters, like Alabama Senator Jeff Sessions, have explicitly done so. Fascists and Nazis wanted to create a new man and a new woman by abolishing the distinction between public and private life through a network of totalitarian institutions. In other words, they wanted to merge society into the state. Trump wants to make "America great again," but he has never expressed a totalitarian aspiration to create a new and presumably better American. Still, his demeanor and his taunts are those of the "strong man" who will fix problems. Trump's insults preclude any serious effort at building consensus. His vision of politics is that of the one-man rule he has enjoyed in his "great, terrific business." Trump's confidence about the ease with which our problems can be solved reflects an authoritarian impulse. As to the panoply of liberal freedoms, the right-wing dictators of the 20th century learned to use the means of mass communications, especially the radio, to good effect. Trump emerged as a public figure on television, has received massive publicity on cable and network news, and uses Facebook and Twitter to communicate—almost for free, too. Though Trump has threatened to diminish freedom of the press through the use of libel suits against leading newspapers, he is not yet running on a platform of substituting dictatorship for democracy, or of rescinding the First Amendment. Like right-wing 20th-century dictators, Trump has learned to mass communications to good effect. Mussolini and Hitler vastly expanded the role of the state in the economy and in all spheres of life. They celebrated state power, which initially confused large parts of the Italian and German business elites. A few industrialists turned to the fascists as a presumed bulwark against the vastly exaggerated danger of a Communist revolution. Most initially were skeptical of Mussolini, who began his career as a radical socialist, and of Hitler, who led a party with the word "Socialist" in its name. They did not understand that the fascists intended to use the state to remake society itself, specifically to make a "revolution from the right" that would, so they claimed, replace economic fragmentation and the alienating dimensions of bourgeois society with new national unity established by the primacy of politics of a more powerful state. Trump remains vague regarding the role of the government but tends to repeat conservative mantras about the sins of big government. He has given no indication that he even understands, let alone plans to use, the state to remake American society or to stimulate some kind of cultural revolution. So his movement lacks any explicit goal, except to elect Trump in order to expiate an accumulated mountain of anger against a tenured political class that, in its view, has only its own elitist interests in mind. Trump points to no "third force" beyond capitalism and communism. There is not the slightest hint of the anti-bourgeois impulse of the fascists and the Nazis. He promises capitalism on steroids, wealth for all. In this sense, Trump's authoritarianism is quintessentially American. Trump exudes not the slightest hint of fascist anti-bourgeois impulses. Far from denouncing business, money, and materialism in the name of a new post-materialist national community, his tasteless narcissism knows no bounds. In contrast to the structures of the multinational corporation, Trump owns a family business that is not accountable to anyone but himself. He boasts that his wealth creates the economic foundation for his ability to defy political correctness and say whatever he wants about anything. His reminders to his followers that he is funding his own campaign underscores his distinctive message about the connection between money, power, and the freedom to say whatever he pleases. Trump's petty, narcissistic form of authoritarianism emerges from different experiences than those of Hitler and Mussolini. Their radicalism had much to do with the fact that they were both veterans of World War I. Hitler, in particular, expressed bitterness and disappointment about defeat and, in his view, an unjust peace. The two dictators and their leading associates sought to remake Italy and Germany in the image of a mythologized masculine community of the World War I trenches. They spoke to and for disillusioned veterans who yearned to militarize civilian politics. In place of defeat and unjust peace, they promised a glorious future of national grandeur that demanded geographical expansion, through war if necessary. Trump's authoritarianism, by contrast, is utterly civilian in origins. It is not a transfer the culture of the military (of which he has no personal experience) to the realm of civilian politics. Rather, he translates his own extensive experience of complete control over an almost archaic institution, the family-owned large business, into the political realm. Trump displayed the distinctively civilian roots of his authoritarianism, as well as his contempt for the officer corps of the armed forces, when, at an early point in his campaign, he said that there was nothing heroic about Senator John McCain's imprisonment in North Vietnam. He found nothing noble in McCain's decision to turn down an offer for early release in order to maintain solidarity with his fellow American prisoners of war and the fact that he endured terrible torture as a result. Instead, he dismissed McCain's sacrifice, commenting "I like people who weren't captured"—a kind of callow flippancy made all the more shameless by the fact that, at that same moment in history, Trump was in college, followed by a stint in the family real estate business in New York. Unlike Trump, Hitler admired Islam as a warrior religion with much in common with National Socialist authoritarianism. There is another important difference between Trump and fascists like Mussolini and Hitler. It concerns their views of Islam. Trump's call for a temporary ban on Muslim immigration to the United States reflects the undifferentiated fear of Islam that has become a staple of the far Right in Europe. Hitler, however, admired Islam because he viewed it as a warrior religion with much in common with National Socialist authoritarianism and its celebration of war. Hitler viewed the pacifism that Christianity inspired as weakness. Hitler also was at one with the Arab and Muslim hated of the Jews and Zionism. Trump probably remains unaware of the fact that Nazis and Islamists of an earlier time met on a common terrain of contempt for weakness and liberal democracy. Trump and his supporters think of themselves as being at least cultural Christians, if not more. It's part of their identity, not necessarily their faith. More importantly, after 15 years of war and terror around the world waged in the name of Islam, Trump senses that millions of Americans are fed up with euphemisms and efforts to make fine distinctions. Faced with a President who has refused to state the obvious about the connection between Islamism and terror (whether this is a good or bad idea is beside the point), Trump thrills his followers by dispensing with any and all distinctions between Islam and Islamism. Jeffrey Herf is a history professor at the University of Maryland-College Park and a fellow at the Middle East Forum.